The Meguiars Porter Cable Soft Buff Polishing Kit gives anyone the ability to remove swirls and create an incredible shine. Meguiars Mirror Glaze #105 and #205 contain micro abrasives to correct without creating swirls. 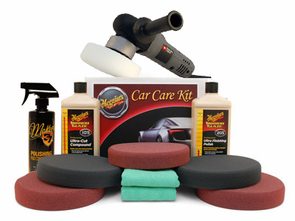 Meguiars Porter Cable XP Soft Buff Polishing Kit includes Meguiars Mirror Glaze #105 and #205. Both� polishes contain micro abrasives which are of a consistent size and shape. These abrasives do not break down like diminishing abrasives. Therefore, micro abrasives provide constant polishing action with a long working time and minimal - if any - compounding swirls. Get your vehicle's shine back with this kit! The Dual Action 5 inch Flexible Hook & Loop Backing Plate� is constructed of urethane has hook and loop material permanently secured from edge to edge. A recessed edge protects the paint from impact and the post is made of durable stainless steel. The 5/16 inch thread fits any dual action polisher with a corresponding thread. Meguiars Mirror Glaze #205 Ultra Finishing Polish was designed to follow #105 and all other Meguiars compounds to remove light swirls and restore optimum gloss. Micro abrasives allow the polish to cut fast and leave a smooth finish in fewer passes. Micro abrasives do not break down like diminishing abrasives, which gives #205 polish a long working time. Meguiars Mirror Glaze #205 Ultra Finishing Polish permanently removes swirls and light imperfections, leaving a smooth, reflective finish. Three Meguiars Soft Buff� 2.0 7 inch Cutting Pads combine rugged durability with finesse. The pad is made of dense foam with a high tech laminate backing that is machine washable! The pad cuts through moderate surface imperfections but leaves very few compounding swirls, which reduces your finishing work. 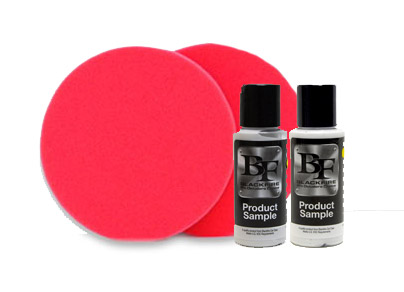 Two Meguiars Soft Buff� 2.0 7 inch Foam Finishing Pads remove light swirls and restores a brilliant gloss! Soft Buff 2.0 Finishing Foam provides a smooth buffing experience with minimal fatigue. The machine-washable pad is built to last with high-tech laminate backing and durable foam. McKee's 37 Polishing Pad Conditioner softens� and lubricates a dry foam pad to prevent the haze that occurs when dry-buffing. Spray a fresh pad before every use to ensure swirl-free polishing. Two 16 x 16 inch Cobra Microfiber Detailing Cloths are great for any variety of detailing tasks, from general washing and scrubbing off road contaminants, to applying and buffing off wax and all-in-one protectants. All the Cobra Detailing Cloths boast an 80/20 polyester/polyamide blend in a special �feather� weave that increases their absorption properties, guaranteeing high performance and durability. A total retail value of $344.88. Save $84.89!